For me miles is all about the quality and not the quantity. It's also about a good climb that rewards me with a sweet downhill. Over the last four years I have developed a love for recumbent cycling. 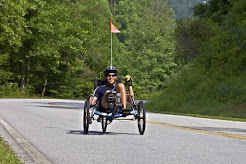 Sitting a few inches off the ground on my recumbent trike while propelling myself forward using my own energy and determination is a fantastic feeling. It wasn't always this way. My passion as a younger man was to hike endless hours in the hills wondering nowhere in particular. 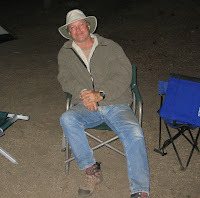 An occasional overnight backpack always rejuvenated me. In time the many miles on foot combined with many years in the construction business proved to be a little to much on my aging bones and joints. I turn 60 this year and I have had my body repaired six times over the last decade and in 2011 I added a heart attack to my list of momentary setbacks. The clicks, cracks and twangs of pain tell me more repairs are on the way but I won't sit still. Before the discovery of recumbent cycling I discovered a special kind of music that took my mind off an aging body. In the year 2000 I met Bill Neal (Elk Whistle-Bill Neal) while he was performing at Satwina in the Santa Monica Mountains. He was playing the Native American flute and I fell in love with it's beautiful sound. 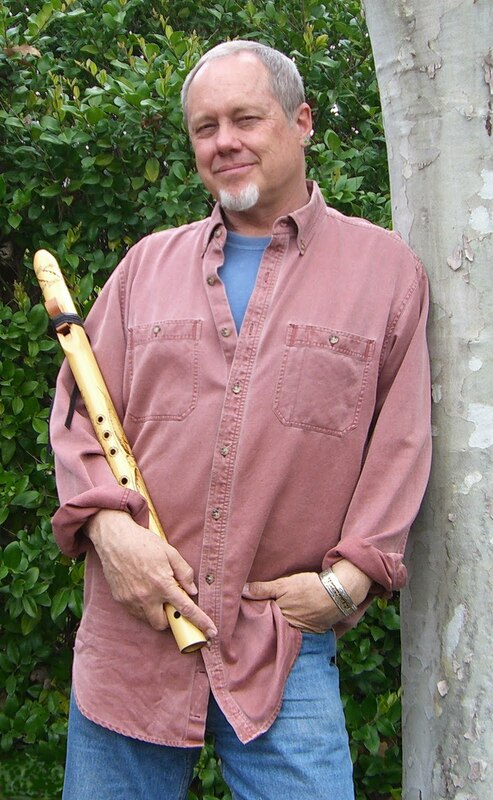 Over eight years my days were filled playing my own Native American style flutes. By the end of 2008 and with the help of my friend Franck Bensoussan. I recorded and published a CD of my music under the Mark Tracy and I'm still selling them at CDBABY. During those eight years of creating music I had given in to a failing body and saw very little hiking or any other real physical activity. After recording my CD my focus changed to getting back in shape and find someone to repair my aching back. In 2009 I started Spinal Decompression with Bruce Shannahoff at the Valley Spinal Decompression Center. Spinal decompression didn't work for me as it as worked for others but Bruce did introduce me to the world of recumbent cycling and it gave me my life back. I have had all the necessary repairs now to keep me active and even though ibuprofen is now part of my breakfast routine I feel good and my life is in balance. In addition to cycling I am once again hiking and keeping my flutes close to me. Cycling will always be my passion. 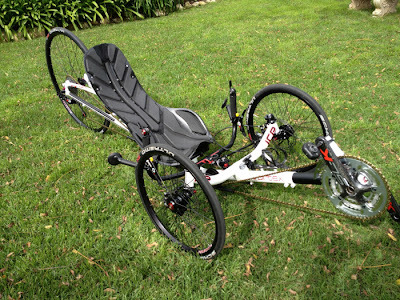 Riding in the open air over long distances on a recumbent trike has given me back my health and it's a lot fun! When I need a little break from the pavement I put on the hiking boots and hit the trail. I use trekking poles to help distribute the load of my 6'1"/ 185 pound frame. What a wonderful light weight contraption these poles are and so effective. If only I had taken advantage of them years ago. My hikes are short, three to eight miles, but I don't have to go far to find what I seek. A wonderful family, cycling, hiking and fluting...balance is with me. 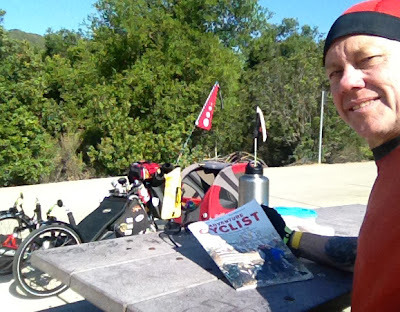 Yesterday while taking a break in the park I got caught up on Adventure Cyclist Magazine and today I'm catching up on the latest Recumbent and Tandem Rider (RTR) magazine. There's a well done review on HP Velotechnik's 26" Scorpion FS. Catching up on some Adventure Cyclist reading at the park. Never stop dreaming. Morning shadows...getting earlier starts as the weather warms up. January of 2011 I dumped AAA and their anti-cycling lobby and joined the Better World Club for auto roadside assistance as well as bicycle roadside assistance. If I have a mechanical breakdown and Carrie is too far away to bail me out I have the peace of mind that I can call the Better World Club and get a lift. If I'm somewhere without cell coverage then I would use my Spot Tracker to send a message to Carrie and she could call the BWC and give my location based on the Spot Tracker coordinates. I got it covered...not only for my peace of mind but Carrie's as well. 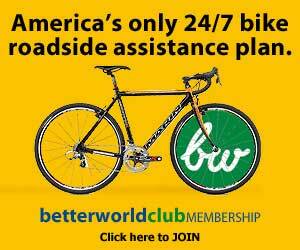 The Better World Club advocates cycling so why would a cyclist be a member of AAA? RTC's (Rails to Trails Conservancy) TrailLink is a great way to find local trails and not so local trails. When a rock slide forced the closure of the Chesapeake and Ohio Canal National Historical Park at mile 155 near the Paw Paw Tunnel in western Maryland, it was bad news for the local and interstate trail users. But it was also bad news for local businesses. This popular trail corridor, which attracts more than 4,700,000 visitors a year, is inextricably linked to the economies of the local communities. The opening of the towpath and its connection to the Great Allegheny Passage has been an enormous boost for the economy with 64.4 percent of businesses reporting revenue increases "at least somewhat as a direct result of the trail." After a hike on Monday and a nice ride today with Betzi along one of my regular short routes I got the traffic buzz out of my head and all is good again. Sunny and cool and a enough room for a stress free ride. The speed limit is 50mph along Lindero Canyon but the bike lane is good and the adjacent traffic lane is extra wide. When I have Betzi in tow I take this short but sweet MUP to get to the park for our usual picnic. My girls Carrie and Leili met up with me at the park. 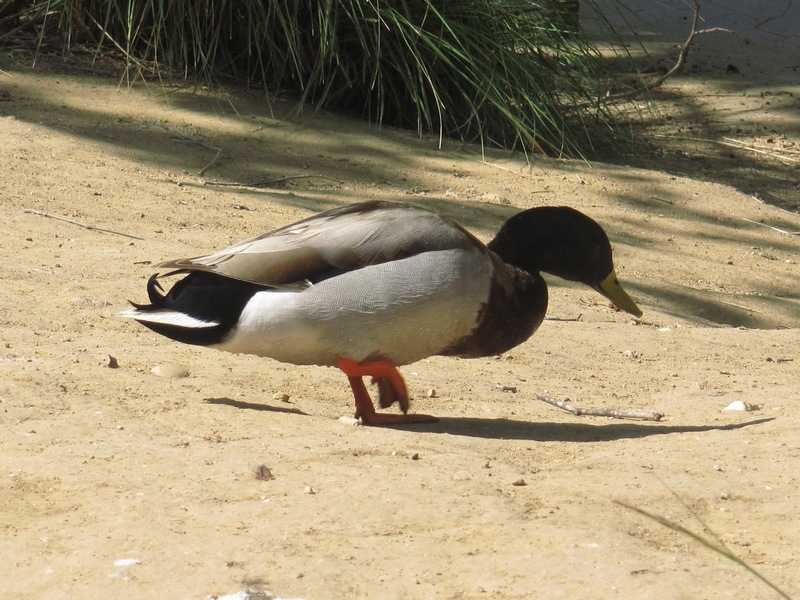 They're already down by the pond feeding the ducks. You can just barely see them in the background. 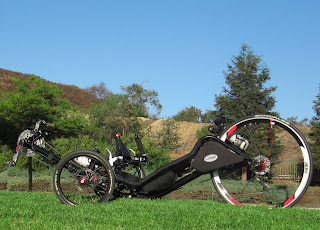 Since my initial impression I've had enough time riding the new Catrike 700 with 20" wheels to be able to say...if I had it to do over again I would not spend the money to upgrade from the "old" 700/16 to the "new" 700/20. Bottom line...I would without a doubt buy a new 700/20 if I didn't already own a 700/16. What I would not do is spend the money on upgrading from an 700/16 to a 700/20. Regardless, I'm having fun showing off and riding the 700 / 20!! The 700/20 has some definite improvements over the 700/16. I like the 20" wheels allowing for more tire choices and the extra ground clearance, beyond that both trikes are equal in my mind. It would take some careful analysis to determine if one trike is faster or handles better then the other. 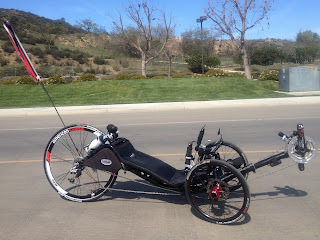 Labels: Catrike 700, Catrike 700 "Black"
There's about 20 miles of good riding I can do from home, beyond that (unless I want to go in circles) I have to include some roads that are less then inspirational. You know...roads with no bike lanes on crowded streets, three lane road that have been jammed into a road designed for two lanes and leaving a token bike lane that is half gutter and half pavement. On some of these less then desirable roads taking the lane is the only option to avoid getting squeezed, which of course doesn't always sit well with some of the yahoos who feel empowered behind the wheel of their one ton lethal weapon. Mind you I say some, most motorists tolerate me and are courteous. I need to clear the traffic buzz from my brain and get a change of scenery that doesn't require constant vigilance. Time for a hike where I can hear the critters and the not cars. 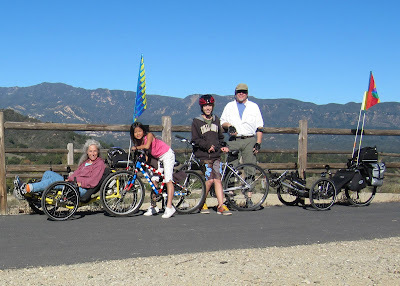 Next...it's time to get out of town and visit the Ojai Trail for some quiet riding. ...and the triking be easy. A stop at the duck pond to munch on some trail mix and to relax and take in the Spring day. Here's a beautiful new ICE Vortex that fellow bent rider Michael is still working on. 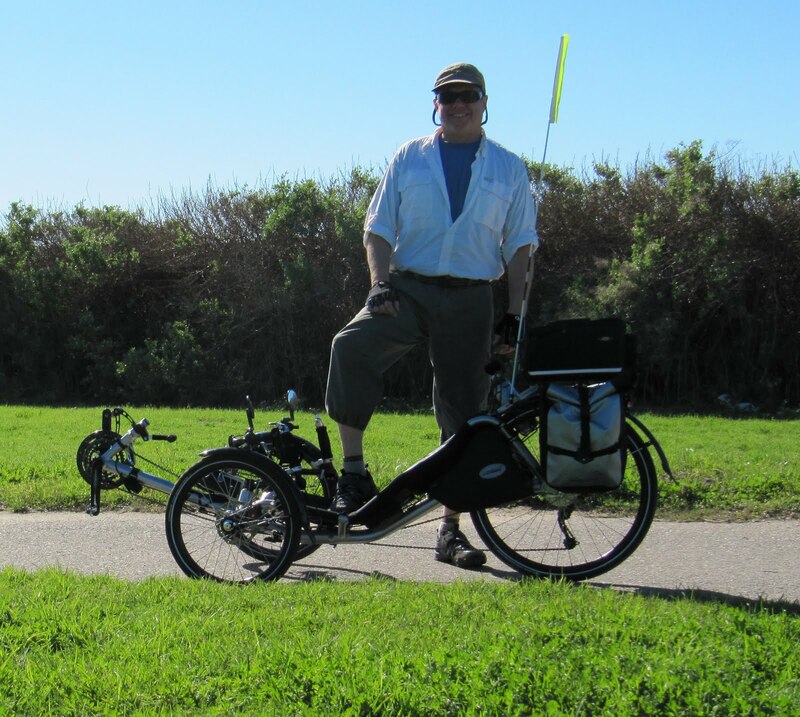 His goal is a sub 30 pound trike. Check out more pictures and information at his Laid Back blog. The placement of chip seal on Highway 1 North of Cambria is a fine example of the unwillingness or inability of car-centric engineers to consider all forms of transportation when designing and repairing our highways. It's all about the car...except this time the weak minds responsible for the destruction of an iconic cycling route are getting a well deserved ear full from cyclists. In a previous post from last Tuesday (Central Coast Chip Seal) I discovered the unforgiving stuff. I'm optimistic that by this time next year the situation will be resolved and once again I can look forward to the pleasure of riding the Central Coast. Caltrans, in almost every respect a good friend to SLO county bicyclists, made a horrible mistake last October when they chip sealed 25 miles of Highway 1 from Cambria to the Monterey County line at a taxpayer cost of $2 million. They have acknowledged their mistake and are making small efforts to mitigate the horrible effects of their project on cyclists and motor vehicle drivers. They refuse to consider the most effective remediation, which is to spend $7 million to lay down a pavement overlay, which would give the highway section at least 25 more years of useful life before needing another rejuvenation. We have their attention. We need to give them the will to spend $7 million dollars to fix it right. What is the economic impact on Central Coast communities if bicycle tourism falls off? Highway 1 is an All American Road, one of 31 in the country, and a destination in itself. 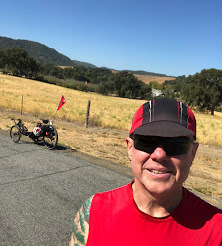 The California legislature designated Highway 1 as "an official state bicycle route" because it is "The most popular long distance bicycle touring route in California." Local and national charities use it as an attraction that draws thousands of cyclists to events that raise hundreds of thousands of dollars. Bicycle touring companies use this route as a mainstay in their tour offerings. Caltrans Information Officer Jim Shivers wrote, "because the binding agents used in this type of work are an evolving technology, so we are short on written specifics for now" – in other words, this job was an experiment with no written specifications for type and size of rock chips to be used. Continued daily sweeping of the project is removing the rock chips that Caltrans put in place – what will be left when they are done? Three major tourist attractions are in the middle of this project – Hearst Castle, Piedras Blancas Light Station and the elephant seals viewing area. Caltrans spent $2 million on this project and does not want to spend $7 million to repair it and do it right – how much do they spend every time a rockslide closes Highway 1 in Big Sur? The project violates Caltrans' own Directive DD-64 that states "The Department views all transportation improvements as opportunities to improve safety, access, and mobility for all travelers in California and recognizes bicycle, pedestrian, and transit modes as integral elements of the transportation system." DD-64 also directs the Department to "Ensure bicycle, pedestrian, and transit user needs are addressed and deficiencies identified during system and corridor planning, project initiation, scoping, and programming." Chip Seal What is Chip Seal? Started off Wednesday morning at 6:30 with my usual cup of tea at the beach and a mini cairn. Ended up at Moonstone Beach later in the day. Thursday started off with morning rain and then it cleared up for another day at another beach. and construct my final mini cairn. Now time to head home. Started out my morning in Cambria at the beach with a cup o'tea and marking my territory with a cairn. I headed out on my Catrike 700 at 9am and started riding North along Highway 1. WHAT WERE THEY SMOKING at Caltrans when they decided to resurface Highway 1 with chip seal. One of the most beautiful and popular rides along the California Coast has been destroyed by this coarse excuse for road maintenance. No consideration for cyclists just get it done cheap. Caltrans figured out that they screwed up big time and they are now in the process of trying to reverse some of the damage. 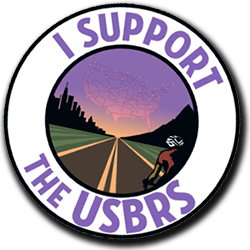 Angry cyclists as well as motorists with cracked windshields from the loose chip seal rumble have voiced their disgust with the weak minds at Caltrans. Before giving up on my northerly route I rode through a construction zone and managed to talk to a couple of the Caltrans crew. They admitted there has been much to say about the nasty new road surface and Caltrans is now trying to resurface some sections of the new surface. They managed to screw up 30 miles of highway from Cambria to the Monterey County line. I had heard about the lousy new road surface and had even signed a petition without knowing how truly terrible the new road surface was until now. I didn't think it could be that bad, it was indeed a nasty ride on my 700. Even my Expedition would have a hard time with this stuff. You need suspension to enjoy this part of the coast. After a couple of miles I turned around and headed south. The chip seal stops at Cambria and the ride South is smooth going but more traffic. The road South, no chip seal. Taking a break on a side road before heading back to meet up with the family. 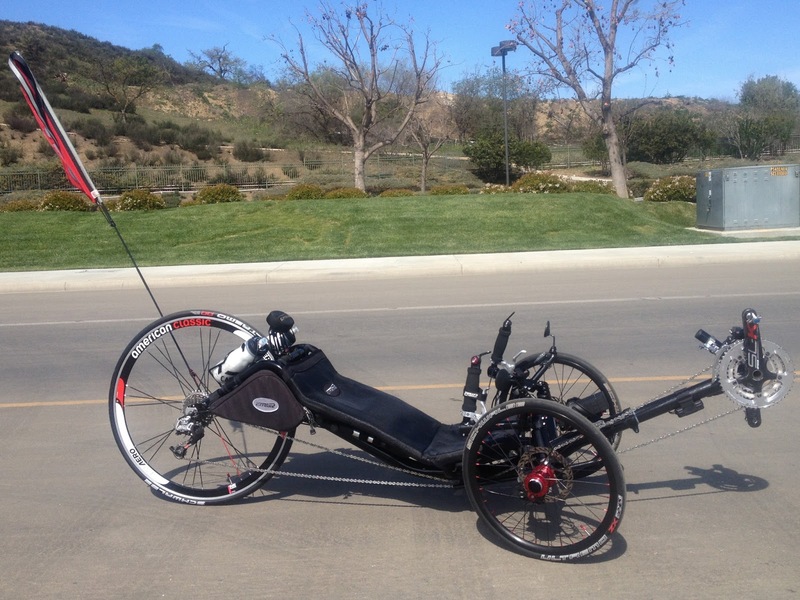 Trike loaded and ready to travel to Cambria on the Central Coast. Kids are happy to get away. Goofing after watching the sun set at Moonstone Beach.